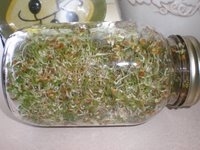 Sprouting Instructions: Yields approximately 2 cups of sprouts. 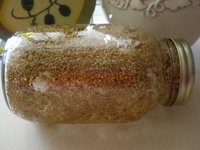 Add 2 tablespoons of seeds to a mason jar with strainer lid. 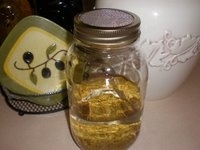 Rinse thoroughly with 60-70 degree water. First day, fill half way with water overnight to soak. Set out of direct sunlight and at room temperature, 70 degrees is optimal. The kitchen counter is fine. Rinse and drain twice a day. At the end of day 5 or the start of day 6 your sprouts will be ready to eat. 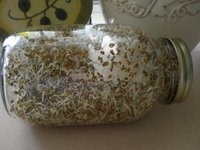 Refrigerate your sprouts 8-12 hours after the final rinse and drain. Enjoy your sprouts in salads, sandwiches, soups, juices, omelets, breads, pizza, stir fry, casserole, scrambled eggs, wraps, dips, spreads, side dishes or as a topping to any dish. Alfalfa - the most famous sprout in the U.S. Alfalfa Sprouts have a mild flavor, an abundant amount of nutrition, and easy to grow. Nutritional Information - Vitamins A, B, C, E, and K. Also calcium, iron, magnesium, phosphorus, potassium, zinc, carotene, chlorophyll, amino acids. Protein - 35%.